Rising trends in GDP per capita are often interpreted as reflecting rising levels of general wellbeing. But GDP per capita is at best a crude proxy for wellbeing, neglecting important qualitative dimensions. 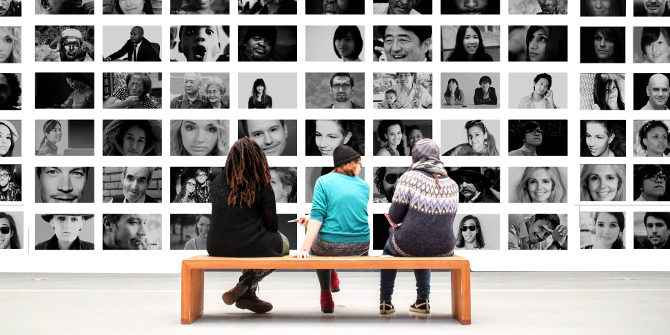 This column explores the long-term trends in global wellbeing inequality using a new dataset. Inequality indices reflecting various aspects of wellbeing are shown to have been declining since WWI, unlike real GDP per capita inequality. Leandro de la Escosura (Universidad Carlos III) writes on his recent paper for the 2nd annual LSE-Stanford-Universidad de los Andes Conference on Long-Run Development in Latin America. 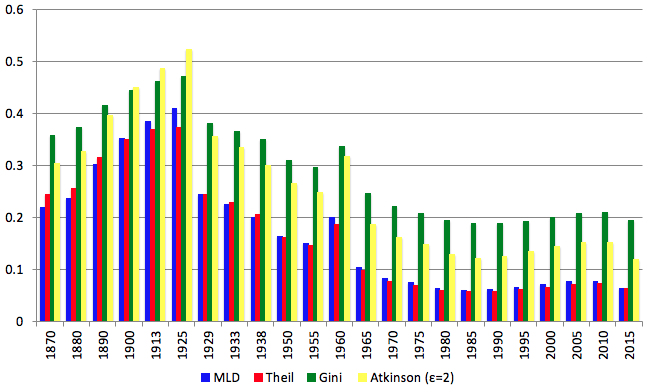 In the last one and a half centuries, substantial gains have been observed for wellbeing dimensions beyond GDP per capita – including health, education, political voice, civil liberties, and personal security (Bourguignon and Morrisson 2002, Morrisson and Murtin 2009, Prados de la Escosura 2015, Pinker 2018). How have these gains been distributed? Do inequality trends in wellbeing dimensions concur? In recent research, I have tried to answer these questions by presenting a long-run view of global wellbeing inequality, based on a new historical dataset (Prados de la Escosura 2018). Most studies address inequality in social wellbeing dimensions using their original values (Becker et al. 2005, Bourguignon and Morrisson 2002, Morrisson and Murtin 2013), but as non-income wellbeing indicators have asymptotic limits (reflecting biological or physical maxima), the range of variation is very narrow, forcing smaller gains (both absolute and relative) as their levels get higher (Sen 1981, Dasgupta 1990). The shortcomings of using original values – or, by the same token, linear transformations thereof – become more evident when quality is taken into account. Life expectancy at birth or years of schooling are just crude proxies for a long and healthy life with access to knowledge. These objections are particularly relevant when the distribution of social dimensions of wellbeing are measured across countries and over time, as the use of original values unavoidably leads towards convergence. A way of mitigating this spurious tendency is to employ Kakwani’s (1993) non-linear transformation of health and education dimensions, which for achievements of the same absolute size imply that the higher the starting level, the larger the impact. Initial high levels of inequality in education – well above those for per capita income and life expectancy at birth – are observed in the late 19th and early 20th centuries, prior to the diffusion of mass primary education (Benavot and Riddle 1988). Thereafter, inequality experienced a steady decline throughout most of the 20th century in terms of literacy and years of schooling. In terms of gross enrolments, these fell until the early 1980s, but suffered a reversal in the 1990s. Nonetheless, inequality was still high in the third quarter of the 20th century. Globalisation of primary education has steered the inequality decline. Inequality in life expectancy has been driven by the diffusion of the ‘health transitions’. During the epidemiological (or first health) transition, relating to the diffusion of the germ theory of disease, persistent gains in lower mortality and higher survival were achieved, as infectious disease gave way to chronic disease as the main cause of death (Omran 1971). Thus, substantial achievements in longevity were attained. However, these gains were not shared equally within societies and across countries – lack of economic means and basic scientific knowledge prevented it. The increase in life expectancy inequality in the late 19th and early 20th centuries can be tied to the uneven distribution of the first health transition, initially restricted to advanced western countries (Figure 2). The gradual international diffusion of the health transition between the 1920s and the 1970s helps to explain the reduction in life expectancy inequality. Its contraction was particularly intense during the globalisation backlash (1914–1950), at a time of stagnant or declining average incomes in many countries, and increasing international income inequality (Riley 2005, van Zanden et al. 2014). 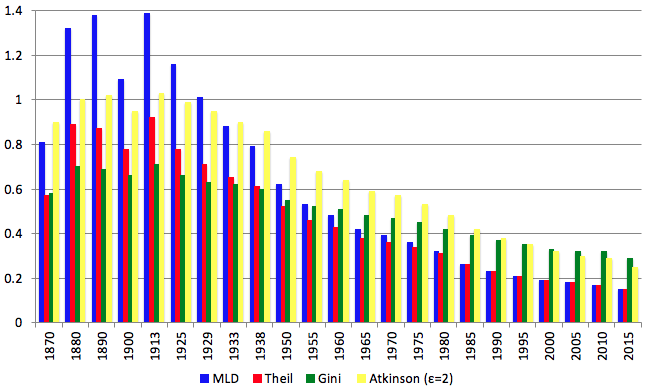 Improvements in public health (often at low cost, as low incomes prevented the purchase of the new drugs), the diffusion of preventive methods of disease transmission, and knowledge dissemination through school education contributed to reducing infant mortality and maternal death, two major determinants of the increase in life expectancy at birth in developing regions (Riley 2001). At the turn of the 20th century, a new health transition emerged. In this new transition, mortality and morbidity have fallen among the elderly as a result of new medical knowledge that has permitted better treatment of respiratory and cardiovascular disease and vision problems (Chernew et al. 2016). The rise in longevity has also been helped by better nutrition in the early years of life. The result is people living not just longer lives, but also healthier lives (Mathers et al. 2001, Salomon et al. 2012). Thus, the increase in life expectancy inequality after 1990 may be associated not just with the impact of HIV-AIDS in sub-Saharan Africa or the effects of the demise of socialism in Eastern Europe, but also with a second health transition so far restricted to the developed world. An association might be suggested between the level of longevity and its international distribution. 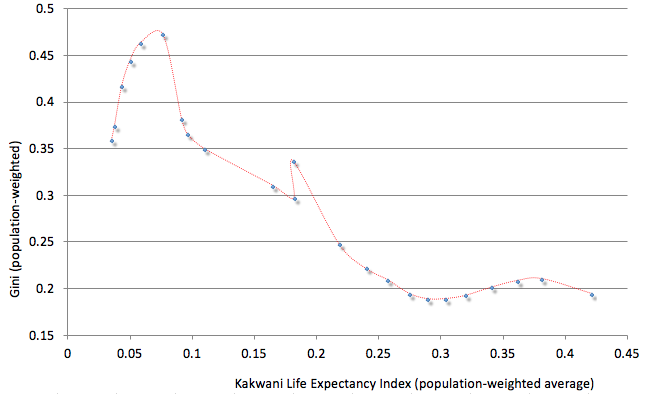 The observed inverted-U shaped curve between inequality and the level of life expectancy at birth could be deemed a Health Kuznets Curve (see Figure 3). The driving force of the Health Kuznets Curve would be the spread of the health transitions across countries. The uneven diffusion of the epidemiological or first transition would account for its rise, while its gradual diffusion across the globe would explain its decline. Moreover, it may be that the closing of the Health Kuznets Curve gave way to a new one. The new Health Kuznets Curve appears to have been short-lived, though, as longevity differences across countries resulting from the uneven diffusion of the second health transition (Cutler et al. 2006) have been offset, at least temporarily, by the recovery of life expectancy in sub-Saharan Africa and former socialist Europe. These findings are at odds with the view on long-run inequality derived from real per capita GDP. While population-weighted income inequality increased until the third quarter of the 20th century, inequality in social dimensions has declined since WWI. Furthermore, the contrast between inequality in terms of income and human development (Figure 4) is striking and challenges the idea that per capita income provides a good predictor of welfare trends. Pressing questions emerge demanding new research. Why did inequality decline in terms of social dimensions, but not in terms of GDP per head? Was it due to public policy, or to the public good properties of medical technology? Why has there been no second health transition in the developing world? Is it the outcome of unequal access to new medical technologies, or of a lack of public policies? As the new medical technologies become accessible, is a decline in life expectancy inequality foreseeable in the 21st century? Becker, G S, T J Philipson and R R Soares (2005), “The quantity and quality of life and the evolution of world inequality”, American Economic Review 95(1): 277–291. Benavot, A and P Riddle (1988), “The expansion of primary education, 1870-1940: Trends and issues”, Sociology of Education 61: 191–210. Bourguignon, F and C Morrisson (2002), “Inequality among world citizens”, American Economic Review 92(4): 727–744. Chernew, M, D M Cutler, K Gosh and M B Landrum (2016), “Understanding the improvement in disability free life expectancy in the US elderly population”, NBER Working Paper 22306. Cutler, D M, A Deaton and A Lleras-Muney (2006), “The determinants of mortality”, Journal of Economic Perspectives 20: 97–120. Dasgupta, P (1990), “Well-being and the extent of its realization in poor countries”, Economic Journal 100(400): 1–32. Kakwani, N (1993), “Performance in living standards: An international comparison”, Journal of Development Economics 41: 307–336. Mathers, C D, R Sadana, J A Salomon, C J L Murray and A D Lopez (2001), “Healthy life expectancy in 191 countries”, Lancet 357: 1685–1691. Morrison, C and F Murtin (2009), “The century of education”, Journal of Human Capital 3 (1): 1–42. Morrisson, C and F Murtin (2013), “The Kuznets curve of human capital inequality: 1870–2010”, Journal of Income Inequality 11(3): 283–301. Omran, A R (1971), “The epidemiological transition: A theory of epidemiology of population change,” Milbank Memorial Fund Quarterly 49(4): 509–538. Pinker, S (2018), Enlightenment Now: The Case for Reason, Science, Humanism and Progress, Allen Lane. 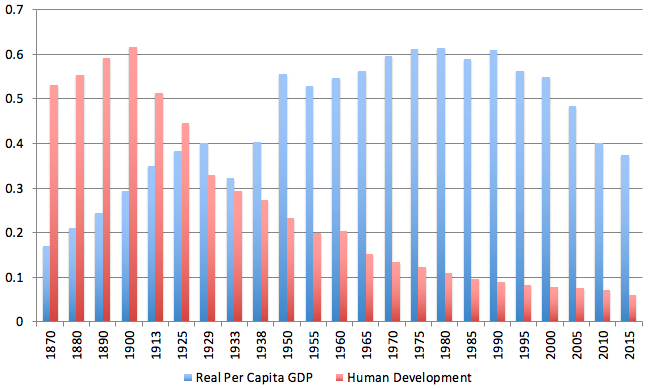 Prados de la Escosura, L (2015), “World human development: 1870-2007”, Review of Income and Wealth 61(2): 220–247. Prados de la Escosura, L (2018), “Wellbeing inequality in the long run”, CEPR Discussion Paper 12920. Riley, J C (2001), Rising Life Expectancy: A Global History, Cambridge University Press. Riley, J C (2005), Poverty and Life Expectancy: The Jamaica Paradox, Cambridge University Press. Salomon, J A, H Wang, M K Freeman, T Vos, A D Flaxman, A D Lopez and C J L Murray (2012), “Healthy life expectancy for 187 Countries, 1990–2010: A systematic analysis for the Global Burden Disease Study 2010,” Lancet 380: 2144–2162. Sen, A K (1981), “Public action and the quality of life in developing countries,” Oxford Bulletin of Economics and Statistics 43: 287–319. Zanden, J L van, J Baten, P Foldvári and B van Leeuwen (2014), “The changing shape of global inequality 1820-2000: Exploring a new dataset”, Review of Income and Wealth 60(2): 279–297. Leandro Prados de la Escosura, D. Phil. (Oxford) and Ph.D. (Complutense, Madrid), is Professor of Economic History at Universidad Carlos III, Madrid. He is also a Research Fellow at the CEPR, a Research Associate at CAGE, Corresponding Fellow of Spain’s Royal Academy of History, and Honorary Maddison Chair at the University of Groningen.